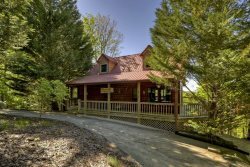 2 bedroom 1-bath secluded cabin is perfect for that romantic interlude. Cozy up to the wood-burning fireplace or enjoy a relaxing soak in the hot tub on the screened porch. Get away to Toby`s Place! Very friendly check-in staff. Thank you Buffy. More than we expected. Very clean and all the amenities.